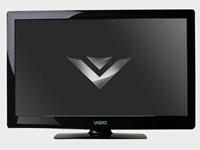 (without stand or speakers) 30.4" x 19.3" x 2.1"
As impressive as it is thin, the 32” Edge Lit Razor LED™ LCD HDTV delivers a brilliant, vibrant picture in a razor thin flat screen. 1080p Full HD gives it vivid color and impressive contrast, while a striking 100,000:1 Dynamic Contrast Ratio supplies truly deep blacks and brighter whites. Enjoy immersive surround sound with SRS TruVolume™ that limits volume inconsistencies between programming and SRS TruSurroundHD™ audio that turns your room into a personal theater. It delivers a virtual surround sound experience marked by clearer dialogue and more precise bass and high frequency signals. Add a VIZIO Soundbar for more intense audio.